Ghar Cycle Tours is owned and operated by Gerry Harris. 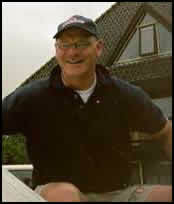 Gerry has been taking high school students and parents to Holland since 1985. The first tour was initialized because of his desire to cycle in the countryside and the opportunity to return to his ancestral heritage. The "Holland Cycle Tours are all about passion for leisurely cycling from village to village enjoying the sights on the well maintained bicycle paths that Holland has to offer. Gerry leads each tour because he wants everyone who travels with him to be personally looked after. His hope is that everyone along on the tours will have long lasting memories of their cycle though Holland, stopping to shop, tour a museum, or just relaxing at an outdoor restaurant. The objective that Gerry has had after retiring from teaching is that those on the tour forget the pressures of regular life and treat themselves to the casualness of cycling in the bicycle friendly countries of Holland.